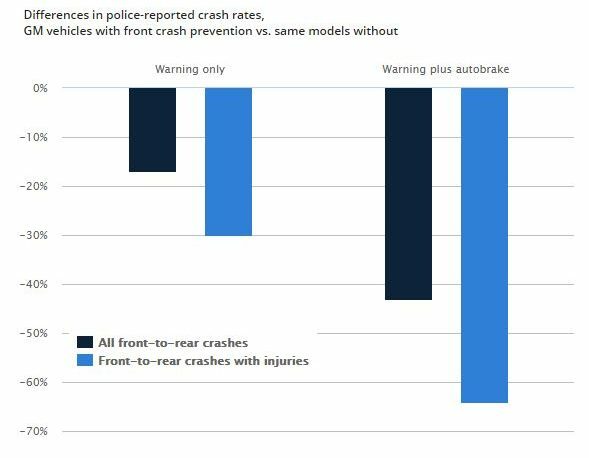 Insurance Institute for Highway Safety research found General Motors’ autobraking and even collision warning alone cut the number of police-reported rear-end incidents, another sign that the technology will affect body shops’ volume. “The evidence has been mounting that front crash prevention works, and it works even better when it doesn’t solely rely on a response from the driver,” IIHS research Vice President and study author Jessica Cicchino said in a statement Tuesday. General Motors gave the IIHS VIN numbers for 2013-15 Buicks, Cadillacs, Chevrolets and GMCs with and without the active (the car can control itself in a pinch) or passive (the driver still needs to react) crash prevention technology. Cicchino paired this with 23 states’ police reports containing information about where the vehicles were struck. Having limited the study to front-to-rear crashes, she then worked out crash rates per insured vehicle year through data from the IIHS’ Highway Loss Data Institute. She used other HLDI and GM data to control for other crash-related factors like vehicle location, the driver and advanced headlights. GM vehicles with both autobraking and the collision warning posted 43 percent fewer crashes, and crashes with injuries fell 64 percent. Forward collision warning technology by itself did enough to focus drivers on the threat that front-to-rear crashes fell 17 percent, and crashes with injuries fell 30 percent. The crashes with injuries stat matters to shops as well as doctors, for it suggests that the autobraking was able to at least reduce the severity of the collisions that couldn’t be avoided. This means, for example, that a crash that would have yielded a heavy-hit job for a repairer might be mitigated by the technology to produce a medium-hit job instead. It’d be interesting to see if this mitigation is enough to save a significant number of vehicles from being totaled, which might at least offset a little of what appears to be an inevitable decline in overall collision volume as the technology spreads. Another Cicchino study for the IIHS found a combination of collision warning and autobraking cut rear-ending by 50 percent and injury crashes by 56 percent. A collision warning alone reduced frequency 27 percent and injury crashes 20 percent. That research looked at vehicles from Honda, FCA, Subaru, Volvo and Mercedes. 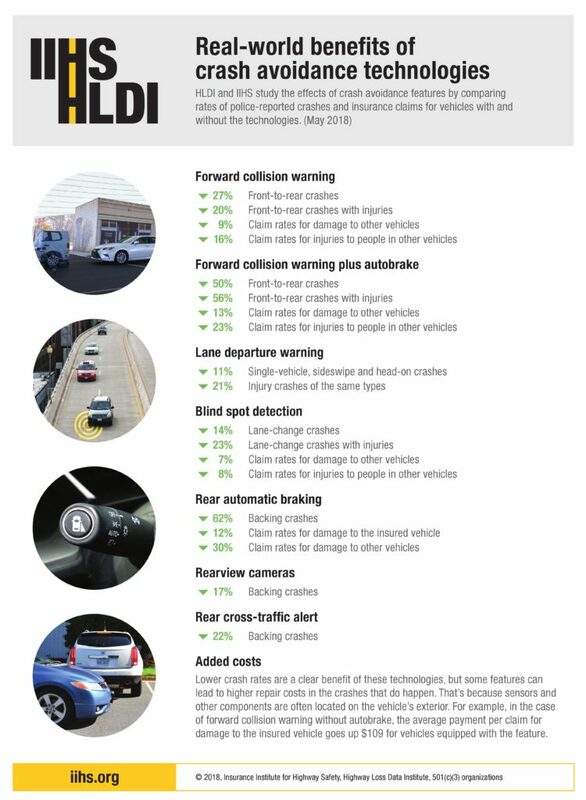 About 21.27 percent of the crashes involving ADAS-less Civics studied by Honda were non-driveable. But when the vehicle was equipped with the Honda Sensing suite, that percentage fell to 12.18 percent. That’s a 31.53 percent decrease in the proportion of non-driveable vehicles. Virtually all automakers have committed to making full-blown autobraking standard by 2022, and General Motors spokesman Tom Wilkinson told Consumer Reports that more than 70 percent of its vehicles have autobraking as at least an option. However, even older vehicles could be upgraded with just the collision warning systems shown by the IIHS to threaten repairer volume. A Ducker Worldwide-Center for Automotive Research study released in 2017 by SEMA found that retrofitting vehicles with advanced driver assistance systems could bring in more than a billion dollars to the aftermarket by 2021. SEMA vehicle technology Vice President John Waraniak last year described passive systems like forward collision or lane departure alerts as the “low-hanging fruit” worth pursuing first. 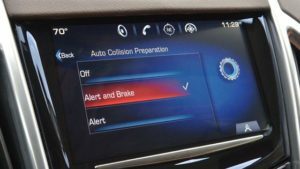 Ducker and CAR estimated the forward-collision warning system business would grow at a 14 percent compound annual growth rate. The report noted that the existing demand for ADAS retrofits comes from commercial fleet industries, “due to safety concerns for a large-vehicle population; these systems provide protection against rising insurance rates.” But it saw the market shifting from a 60-40 fleet-individual driver split in 2016 to an even 50-50 divide by 2021.